I am sitting here during coffee break at the NASA Precipitation Science Team Meeting in Annapolis, Maryland. This meeting is a gathering of the world’s top scientists working with the TRMM, GPM, and other NASA programs related to precipitation, weather, climate, and hydrology. A prevailing lament of many of my federal colleagues attending this meeting is the concern about the ability to attend scientific meetings because of travel restrictions and sequestration/budget issues. As I ponder their laments, I reflect on whether (1) these colleagues are spoiled federal employees not adjusting to austere budgets, (2) these colleagues are victims of a perception about federal employee travel because of a few isolated bad choices (e.g. GSA conference story publicized in the media, or (3) I have a bias as AMS president because we host meetings and have an interest at stake. We risk stifling scientific and technological innovation: Yes, budgets are tight and some travel/conference activities (a very small percentage) are questionable. However, as someone that has attended scientific meetings and conferences for over two decades, these meetings are very intense, intellectually-stimulating, and advance the science. They are not vacations or frivolous. I arrived at the meeting room yesterday at 7:45 am, sat through various sessions, met with two different working groups/planning committees, and discussed a potential new scientific collaboration. I got to dinner at 8:15 p.m. There is a movement towards the use of various videoconferencing solutions. Those advocating these measures have completely missed the point that the most valued aspects of attending conferences and meetings are the “hallway” meetings, poster sessions, lunch/dinner meetings that lead to potentially transformative research, or the chances to caucus with colleagues on a new method or technology. (AMS Executive Director Keith Seitter made these points in The Front Page in December.) The presentations (what gets videoconferenced) are important but often secondary or tertiary to the value of such meetings. All professions stay current on their topic, why should scientists and engineers be different? : I cannot imagine any profession or industry not wanting its employees to be current on the latest methods, techniques, and discussions. I am certain that leading companies continuously train their employees. Scientific meetings are “the training” for many professionals. For example, our AMS annual meeting has up to 20+ “conferences” within one conference. It also has various short-courses, town halls, and briefings. I argue that we risk “dumbing down” our U.S .scientific workforce with such arcane travel restrictions. At a time when we need to push the innovation envelope for society, we risk folding it up and discarding it. As an example, our Air Force pilots are the best in the world. They develop their skills through course work and flight simulators. However, at some point, they have to get into a real aircraft and interact with other pilots to gain knowledge, experience, and “tricks” of the trade. Another offshoot of federal travel restrictions is our standing with the international community. U.S. presence is essential at many international meetings. Many of our collaborators and colleagues abroad are also being affected in terms of their own meeting planning, expectations, and the possibility of no U.S. presence. Does anyone see the inherent problem with this from the standpoint of international partnerships and our reputation? What I also find amazing (and admirable) is that many federal colleagues (often called “lazy” or not-dedicated) have paid their own way to meetings or conferences. But if they do this, are they representing themselves? Should they discuss their work at the conference (since technically they are on vacation)? Stifling the Private Sector: The private sector and small businesses are critical to our economy. I spoke with several major company representatives and small businesses at our 2013 Austin AMS meeting. They were also lamenting. They were talking about how the lack of federal attendees severely hinders their access to potential new clients and business. This has more than a trickle down effect on the health and vibrancy of our private sector and its contributions to economic vitality. The Next Generation: As a young meteorology student at Florida State, I was in awe of attending the AMS and other meetings and having the opportunity to meet the woman who wrote my textbook, the Director of the National Hurricane Center, or a NASA satellite scientist. Our current generation of students (undergraduate or graduate) are in jeopardy of losing these valuable career-enriching opportunities. 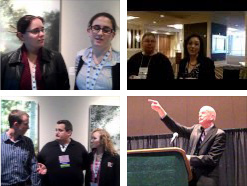 AMS, for example, hosts a Student Conference and an Early Career Professional Conference. By design, we expose hundreds of future scholars, scientists, and leaders to the top professionals in our field. In 2013, many of these professionals can’t travel or have to jump through hoops to declare the travel “mission critical” in NASA-speak (I spent 12 years as a NASA scientist). I conclude that I am not being a “homer” on this issue. There are real concerns about the status and future of scientific discovery, innovation, private industry health, international reputation, professional development of our workforce, and exposure of our next generation. Video conferencing just won’t get it. AMS has a Green Meetings initiatives. Videoconferencing may be highly appropriate for smaller committee and board meetings but not large scientific meetings, which was the point of this post. Thanks for this very articulate description of why it harms federal government scientists to not attend meetings. It is indeed a critical part of their “training” and we cannot work on relevant topics if there are no means or mechanisms to engage with our colleagues from academia or abroad. Also, I would add that younger scientists who are looking at a potential federal government careers will be scared off by the inability to travel and engage with their scientific counterparts. This policy is causing perverse outcomes. I know of cases in which people cannot travel even when the meeting organisers are willing and able to cover the full costs of the federal employees. It harms international collaboration. At a time when the US teeters on the brink of becoming a follower rather than a a world leader in a number of crucial arenas (including science and technology), cutting off travel for Federal employees, especially those in NOAA, is short-sighted. The weather enterprise sits at a cross roads, poised to more fully engage the nation in becoming truly weather ready, science aware, safety savvy, and climate literate. But moving beyond this cross road requires more and more direct interaction among individuals within and without the current borders of the enterprise. And a failure to fully engage the young, the differently abled, the current planners and investors, the innovators, and the global community can only mean we will spend more resources than we perhaps have to be reactive to the physical, social, economic, and political forces comprising our (collective) daily reality.